Sometimes we are on the ball with April 1st, but sometimes we forget. There's a chance your significant other might be on the ball and know your tricks right away, but on the off chance they might not remember, here are some ideas! 1. Get a doughnut box (from Dunkin or something) but put fruit and veggies inside and set it on the counter in the morning. 3. Change contact names in their phone. Get creative and change them to movie or video game characters. Make sure you make yourself a note on whose names were changed! 4. Change their autocorrect. On an iPhone you go to Settings--> General --> Keyboard --> Text Replacement. You can then add whatever shortcuts you want. Make it fun and use common words like "go" and "now" and change them to random things like "diarrhea" and "clown school". 5. This takes some effort, but go move their car to another spot while they're at work. 6. Leave a note on their car. Have it say something like "saw someone break into your car, thought I'd let you know" and watch them search for what's missing. Even better, make a ziploc bag of baking soda and leave a note with it on their car saying "had to get rid of this fast, please use wisely". 7. Download an embarrassing ringtone to their phone and put it as the text tone. 8. When they text you, respond back with something like "I'm sorry, this carrier has been permanently disconnected from this account. Please visit at&t.com for more information." 9. Buy or make a glitter bomb and stick it in their work bag. 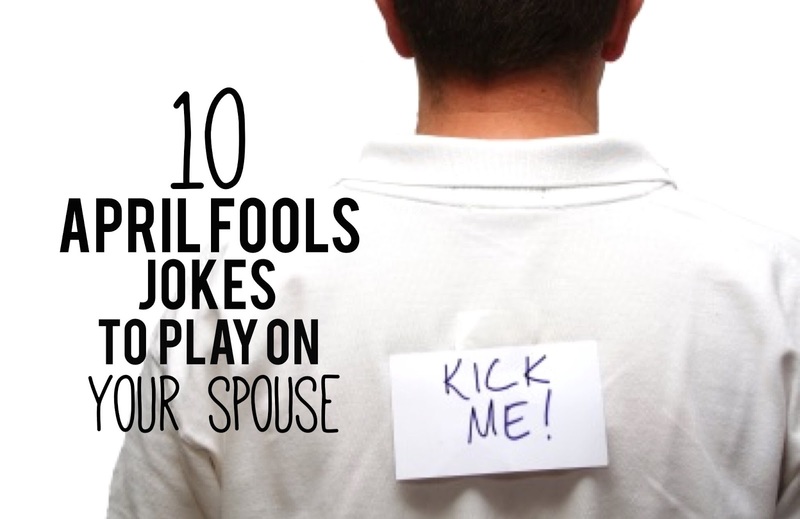 Hopefully your spouse has a good sense of humor and won't give you the silent treatment for 2 weeks! Does anyone have any funny pranks they've done or plan to do?! THIS IS ABSOLUTELY HILARIOUS!!! Oh my gosh, I could never glitter bomb someone I love, but I would totally do this to someone I have beef with..hahahah. Haha that would be perfect for you then! Fun ideas to do. I like the donuts box. We don't eat them and he would be thrilled to see it there. I think that would honestly be the meanest one for us because we love doughnuts! These are so funny! I never think to plan ahead enough to pull off a good April Fool's joke but these are so great that I may just have to do one this year! Ah let me know if you do! I wanna hear about it! Too funny! My husband is always on his phone, so if I can get it away from him, I'm going to do one of those. Probably the ring/text tone. I know! It would be tough for me to take it for longer than a minute otherwise it might get suspicious! I am so bad..like pathetically bad at lying or keeping a straight face for anything! I love these ideas though! I LOVE these!! Hysterical! The glitter bomb needs to happen LOL!